The USBee DX Test Pod is a HUGE sample buffer PC and USB based programmable multifunction digital storage 2-channel oscilloscope, 16-channel logic analyzer and digital signal generator in a single compact and easy to use device. It is the ideal bench tool for engineers, hobbyists and students. Connecting to your PC, the USBee DX Test Pod uses the power and speed of the USB 2.0 bus to capture and control analog and digital information from your own hardware designs. 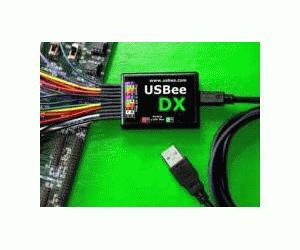 The USBee DX takes advantage of already existing PC resources by streaming data over the High-Speed USB 2.0 bus to and from the PC. This allows the PC to perform all of the triggering and data storing and makes possible an affordable USBee DX, while pushing the sample storage capabilities orders of magnitudes beyond that of traditional dedicated oscilloscopes, logic analyzers or signal generators. The USBee DX Test Pod can utilize available PC memory as the sample buffer, allowing selectable sample depths from one to many hundreds of millions of samples. The USBee DX Test Pod can capture and generate samples up to a maximum of 24 million samples per second depending on the PC configuration. The USBee DX Auto-Calibration feature automatically reduces the sample rate to ensure accurate and reliable timing, even on systems with slower processor and USB bus speeds.The USBee DX Test Pod perfectly merged features and functions to provide exactly the performance needed for hardware and microprocessor designs such as BASIC Stamp and PIC systems to ensure an affordable and compact unit. The USBee DX Test Pod does not need an external power supply. The USB bus supplies the power to the pod, so your PC will be supplying the power. The Pod does, however, require a self powered hub (not bus powered) if a hub is used between the PC and Pod.